TRAACA members Rad and Margie Tillett, Bob and Shirley Woolfitt, John and Vicky Peters, Bill Wilcox, Ken Talley, and Bob Stein went on a 16-day cross-country trek celebrating the 75th anniversary of the Lincoln Highway from August 17-September 1, 2003. Follow their journey from the start in New York on August 17th all the way to the closing ceremonies in San Francisco on September 1st. Click on the links below for pictures and text on each day's activities! 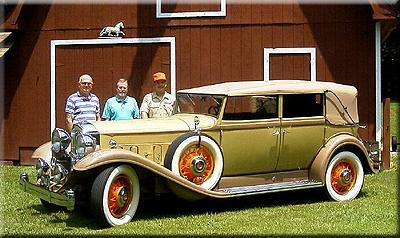 THE TRAACA ENTRIES - Bob and Shirley Woolfitt drove this magnificent 1934 Packard 12 1107 Formal Sedan (above, left). Bill Wilcox participated in one of the oldest cars on the tour, his stunning 1932 Packard Convertible Sedan (above, right). From left to right are master mechanic Ken Talley, owner Bill Wilcox, and designated flunky and roaming webmaster Bob Stein. 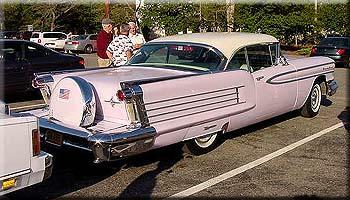 At left, bottom, Marge and Rad Tillett's mighty mauve 1958 Oldsmobile 88 added pizzazz to the tour. 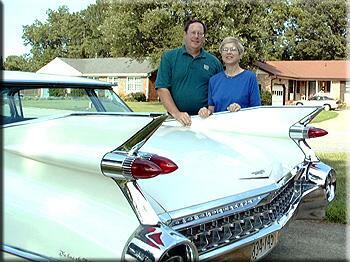 And last but certainly not least are John and Vicky Peters, who joined the trek in their ever-popular 1959 Cadillac. 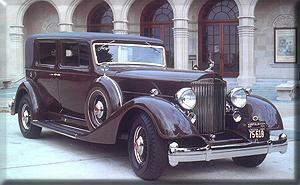 This site is a service of the Tidewater Region Antique Automobile Club of America. All content is copyright 2003. Please address any questions or comments to the webmaster.